The verdict: WeldWerks, who made the top 10 of our 247 IPA blind tasting with their fantastic (and well-named) Juicy Bits, sought to stack the deck in this stout tasting by sending us no fewer than FIVE different beers, all of which were distinct enough to qualify. This “peppermint mocha” offering is easily the most unorthodox, but so help us, it just works. We’ve had a few mint chocolate beers before, but none of them have succeeded in so accurately capturing the heart and soul of a Girl Scout Thin Mint cookie as this one. The chocolate is pleasant without being overbearing or cloying, and the peppermint is unmistakeable but not obnoxious. This is not a style of beer that is ever going to win a huge blind tasting of imperial stouts, if only because it’s so obviously a flavor experiment, but this is just about the best possible version of “mint stout” that we can imagine. You gotta give them some credit for that. The verdict: Kelsen is a brewery I’ve been wanting to add to our tastings for a while, and it makes sense for now to be the time, given that they’re known for dark beer styles and stouts in particular. This one is made with coffee, but it doesn’t come off quite like most of the other coffee-infused imperial stouts. You get the requisite roast on the nose, but more in a dimension of roasted malt rather than distinctly coffee-like. On the palate, it’s surprisingly nutty, with a pleasant, “roasted chestnuts” or hazelnut note, supported by roast, a bit of bread and moderate residual sweetness. Well balanced and pretty easy drinking, it’s significantly more agreeable than the axe-brandishing Viking on the label. The verdict: This particular bottle of Oat is what you could call “well-aged,” in the sense that it was probably sitting on the package store shelf for quite a while before we picked it up, this particular beer having been discontinued at least a year prior. That age, however, has clearly done it some good, mellowing whatever booze presence there once would have been in this 11% ABV beer and emphasizing its decadent, silky texture instead. There’s some dark fruitiness lurking underneath the hood of this beer, and a rogue note of maple that I hardly expected, but found very pleasant. 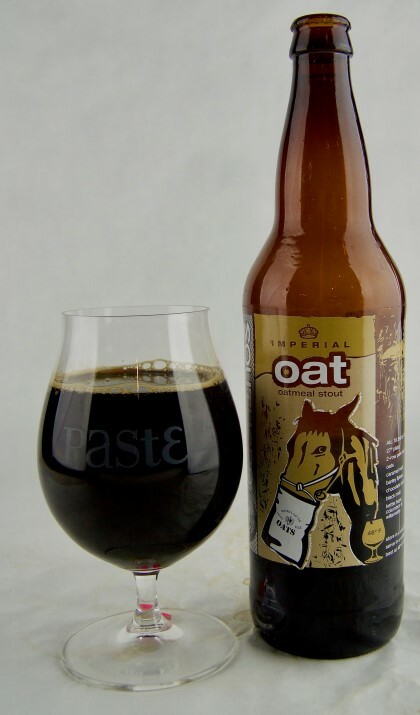 All in all, though, it feels more like an old school oatmeal stout that has just been supersized, combining a bit of crisp cereal graininess with moderate roast, medium sweetness and a drying finish. 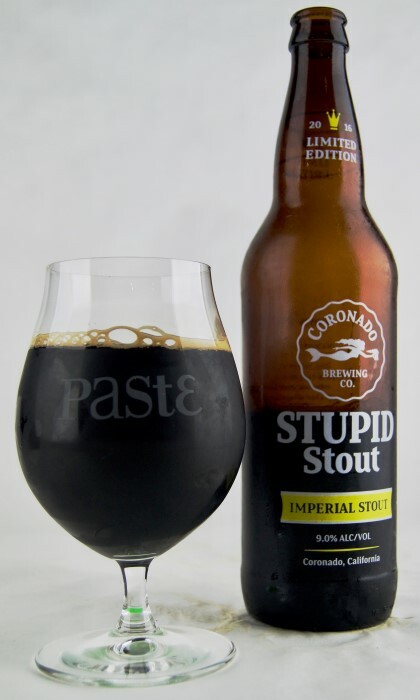 The verdict: Here’s the thing you need to keep in mind about tasting imperial stouts in this format: Even a beer that would normally be explosively flavorful, or bursting with character, is decidedly different when evaluated against a dozen other examples of that style. So when we say that this stout is “reserved” and “balanced,” that’s in comparison to everything else on the table that day, not what the stout would be like if you were comparing it to a Bud Light. That’s how we end up describing a 10.5% ABV imperial stout brewed with molasses and licorice root as “nicely caramelized, with milk chocolate highlights.” It is indeed a bit thinner of body than some of the others, a throwback on some level to old-school American imperial stouts with a distinct hop presence and moderate bitterness that helps keep the sweetness in check. It’s silly to refer to any of these stouts as “drinkable,” but this one certainly is, within the context of the tasting. The verdict: It’s difficult to rate a beer in the mold of Double Stack, because your enjoyment of it is likely going to be determined entirely by two factors. One: Do you like maple syrup? Two: Is the end result too sweet or cloying, in your mind? Regardless, everything about this maple syrup/coffee stout screams “breakfast”—it smells like a platter of flapjacks, syrup, bold coffee and maybe a side bowl of Cinnamon Toast Crunch or Golden Grahams for good measure. The residual sweetness is prominent as you’d expect, and the base beer does get a little bit lost behind all the maple and coffee character, but we had to admit that the final synthesis comes together in a way that is decadent and crowd-pleasing. It stops just short of being too sweet or too gimmicky, and although it’s not a beer you’d likely want to down by the pint, this would be an exceedingly fun crowler to break out at a party. We had a few other maple beers in the tasting, but this one struck us as the most genuine and purest exhibition of what the brewery was trying to achieve. The verdict: In this tasting more than ever, we found ourselves reconsidering our preconceptions of what “coffee” can taste like in the context of a beer. This 3rd anniversary brew from Indiana’s 18th Street is an ideal example—a beer that you could sample blind and possibly miss as being “coffee beer,” despite the fact that it’s bursting with coffee notes. How? It’s the nature of the coffee character, which here comes through in a very spicy, peppery, almost chile-like way that we’ve seen in a handful of other coffee beers before. But that’s just one note in what is otherwise a nicely complex, nuanced stout, supported by prominent dark fruit flavors of raspberry or plum and a hit of slightly smoky, deep roast. Also: An impressively well-hidden 12% ABV. This strikes us as a stout that displays a whole lot of skill on the part of the brewers. 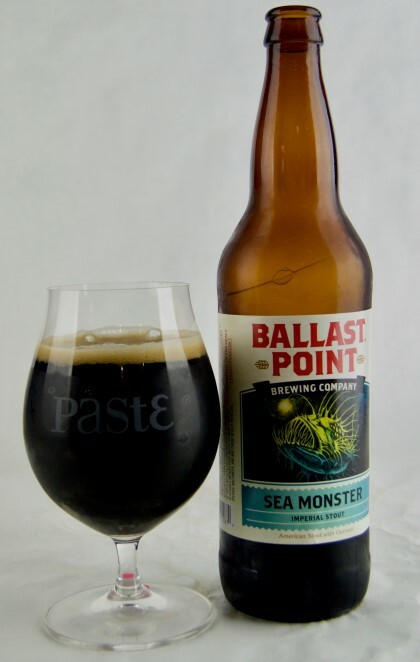 The verdict: Ballast Point’s offering is a bit dryer than most of the other stouts on the table, but that doesn’t mean it doesn’t assert itself. Indeed, it’s almost booze-forward despite being dry, which is an unusual (but effective) combination in this case. Leaning less on an intensity of roast and more on fruit-driven flavors, tasting sheets reveal words like “red fruity,” “currant” and “licorice.” Those fruit impressions give it a slightly viniferous character that you find in some of these high-octane stouts, but regardless, it’s not the sort of imperial stout you’re going to mistake as being crammed full of coffee and chocolate. 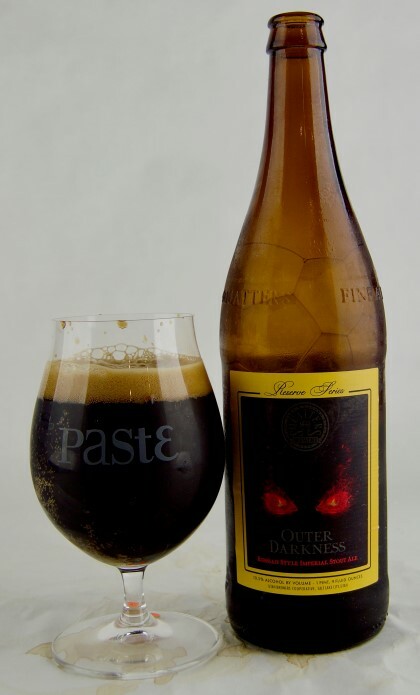 With that said, you do get some pleasant dark, bittersweet cocoa and red fruitiness, supported by enough booze to let you remember what style it is you’re drinking. The verdict: Sometimes, you just want to drink an iced coffee with plenty of sugar, and that’s this stout from Hi-Wire. Taking advantage of the low end of the imperial stout ABV range, it combines fresh coffee, dark chocolate and vanilla bean to form something that is clearly meant to approximate a mocha from your corner coffee shop … perhaps with a shot of vanilla syrup, to boot. Understandably, it’s on the sweeter side of the spectrum, but ultimately it’s right in our comfort zone—moderate residual sweetness without being syrupy or saccharine. Cocoa is the background player here, while coffee is the star—there’s a very nice, firm, fresh coffee character that is made all the more decadent by the touch of vanilla. Final impression: It’s not QUITE a beer that you would have as dessert, but it would be spectacular accompaniment to your dessert. 32. 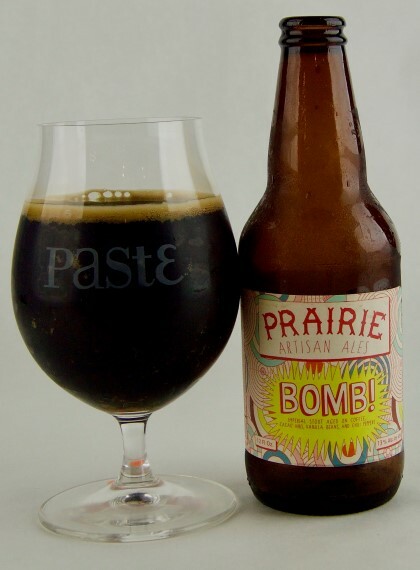 Prairie Artisan Ales BOMB! The verdict: BOMB! is kind of an amazing beer for how deftly and subtly it uses all of its adjuncts. It’s an imperial stout with coffee, cacao nib, vanilla beans and ancho chiles, but unlike so many of the others they’re very much supporting players to the big, thick, velvety imperial stout underneath. Its flavors are complex and anything but obvious, especially in a blind format, but the first impression one gets is textural: Big, thick, viscous and palate-coating. Dark fruitiness is a major player, something along the line of stewed plums/black cherry, with a bit of smoke and substantial roast to back it up. The coffee in particular is really working in the background on this one compared to some of the really bombastic coffee stouts, while the chiles contribute more in the way of fruitiness than they do overt spice or heat. That’s something to look for, in stouts that feature dried chiles in particular—they often contribute dark and dried fruit notes, which are this beer’s signature. The verdict: With all of the attention paid to stouts with coffee, chocolate, chiles, etc., it’s a little easy to forget that one of the old school ways to set off an imperial stout is with American hops. 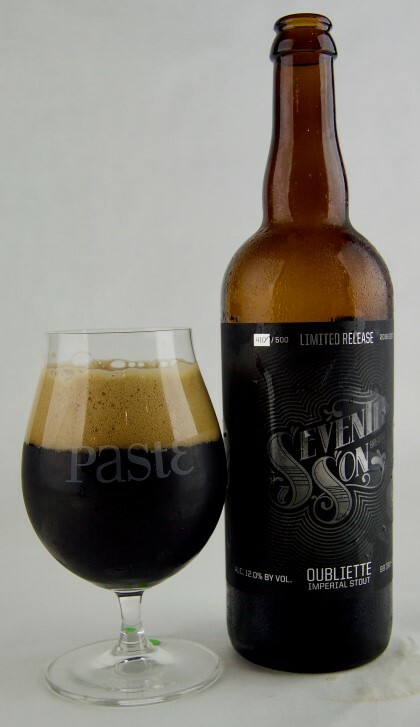 That’s not to say that Oubliette is strongly pronounced in its hop rate, but the slight herbal and pine flavors they contribute here, and a firm background of bitterness, does work to set it apart from many of the other stouts on the table. 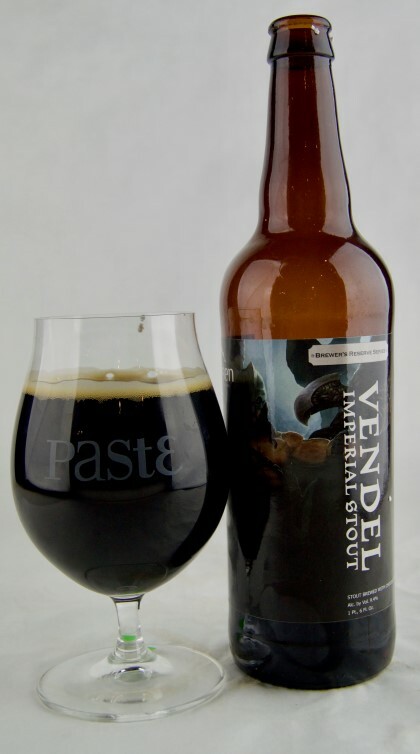 It’s otherwise a very well-balanced, classic imperial stout profile that is less dark fruity than the last few and more driven by solid roast, coffee-like flavors, light caramel and dark chocolate notes. 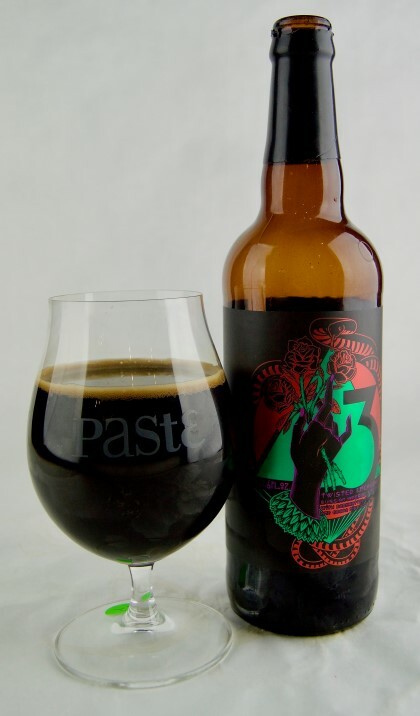 It deftly pulls off the feat of having a pleasantly smooth, creamy mouthfeel with actually being a tad lighter of body than most of the other stouts in the 12% ABV range, and hides its booze impressively. All around impressive, in terms of balance. The verdict: Given that Terrapin is just down the highway from Paste’s home in Atlanta, we’ve known most of their beers for a long time, and we’ve slowly come to a conclusion: Dark beer is not-so-secretly where this brewery excels. 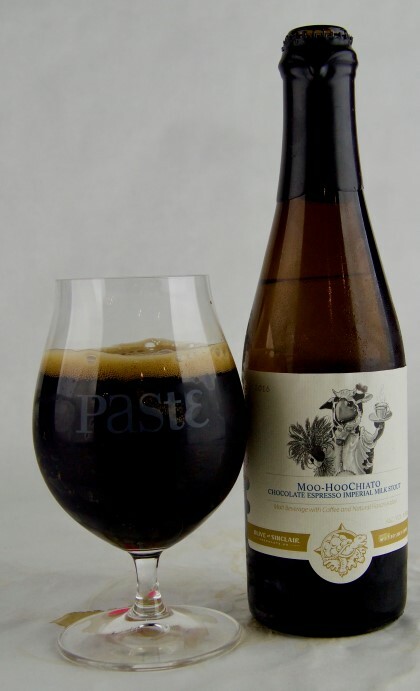 Moo-Hoo is already one of the best milk stouts around, but the addition of coffee and chocolate takes this one to the next level. Its flavors are very much in your face, especially for its stature—both in assertiveness and mouthfeel, it feels like a much bigger beer than 8.5% ABV. The coffee character is very dark, intense and lightly smoky, like a Vienna or French roast, while the lactose provides a very creamy, velvety texture. Chocolate is also present in a big way, very rich and “fudgy,” with pronounced residual sweetness. 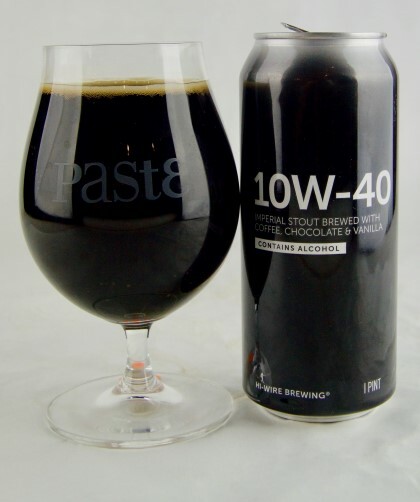 The end product actually has quite a bit in common with the Hi-Wire 10W-40 above, but of the two we’d say that Moo-HooChiato is a bit more bombastic (in a good way), reveling in its cocoa impressions in particular. This isn’t the kind of beer you call “sophisticated,” it’s just guilty pleasure stuff of the best sort. The verdict: This beer has been around for a good while now, and it’s time we recognize Serpent’s Stout as a classic example of the genre. Tasters here were impressed by the depth of roast, an area of stout that we sometimes tend to think of as one-dimensional. This roast character is a little smoky, almost “ashy” or like that of charred oak, which contributes bitterness but then segues into deep caramelization and molasses-like sweetness. Not done yet, it then moves into raspberry-like dark fruit. Excellent balance overall, and heavy on the roast, it’s very close to my personal concept of the platonic ideal in imperial stout flavor profiles. 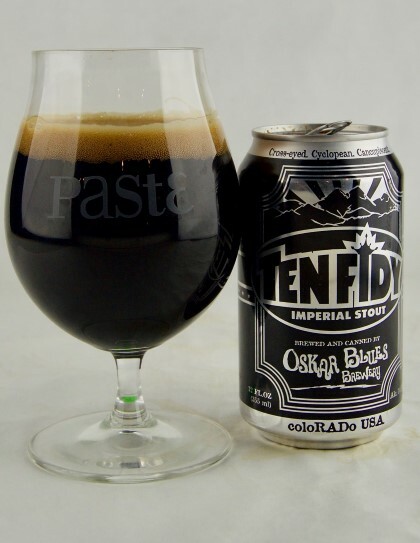 The verdict: Good old Ten FIDY—it’s as dependably great an imperial stout as there is on the market, and we like it every time we taste it. 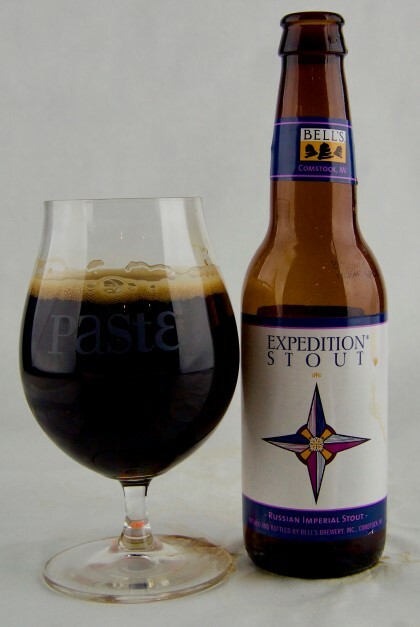 In terms of flavor profile it’s really rather similar to the beer that precedes it, as both are excellent examples of how American brewers took “Russian imperial stout” and defined it for the modern craft beer palate. Big and thick of body, it’s a little less distinctly roasty than the preceding Serpent’s Stout, and instead just a bit more in balance with its fruity and lighter roast notes—think light roasted coffee, roasted nuts and perhaps a bit of toffee as well, with a small dose of hop-derived bitterness. It’s an excellent beer to use as a measuring stick or definition for the style in a competition or blind tasting setting, because it checks all of the different boxes: Roast, fruit, caramelization, hops. We look forward to seeing how multiple barrel aged versions of this beer do in next month’s blind tasting of barrel aged stouts. 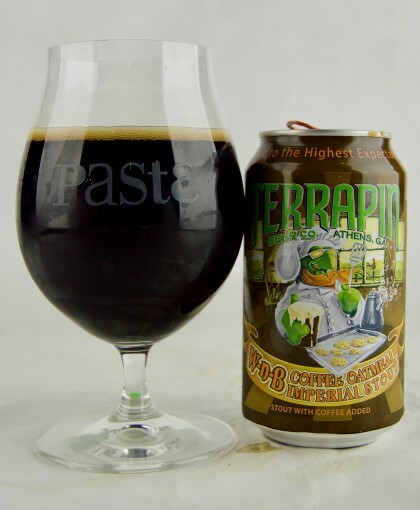 The verdict: Did you know this beer was once called “Terrapin Coffee Oatmeal Imperial Stout”? I sure as hell didn’t, but thank god they eventually changed the name, because “Wake ‘n Bake” is immeasurably better. 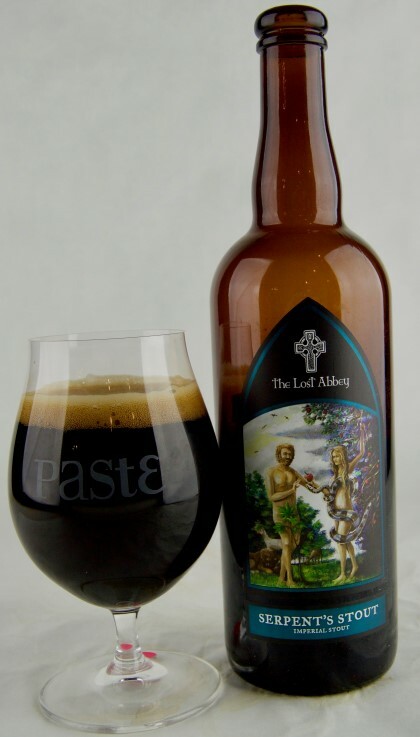 It has a reputation as a classic coffee stout that is heavy on the adjunct flavors, but we actually found it considerably more subtle than many of the other coffee-infused stouts in this particular tasting. Indeed, the coffee character blends well with the native roast in a seamless sort of way, where it’s hard to tell where one ends and the other begins. Perhaps more impressive is the distinct note of dark chocolate present throughout, for a beer made without baker’s chocolate or cocoa nib additions. There’s even a slight hint of pine/herbal hops that become apparent on repeat visits. For a beer that purports to be a delivery vessel for coffee, there’s quite a lot going on under the surface in Wake ‘n Bake, which we can certainly appreciate. 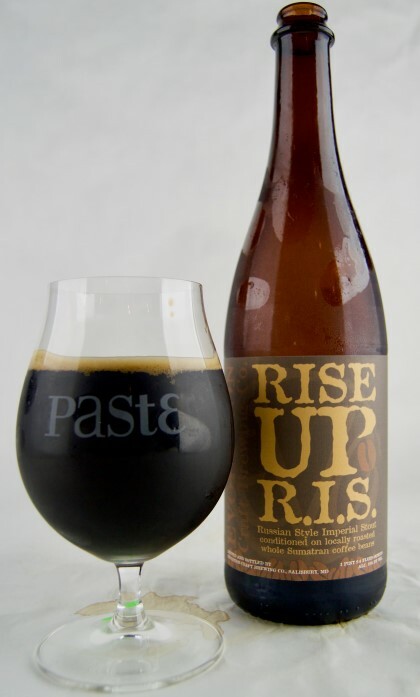 The verdict: We quite liked the regular Rise Up coffee stout from Evolution back in the fall of 2015, when we blind-tasted American stouts under 8% ABV, so we’re not surprised to find ourselves enjoying its bigger brother as well. This imperial version packs a peppery, spicy coffee character that bears a passing resemblance to the 18th Street Twisted Engagement, but slightly less intense. Coffee is still the dominant impression both on the nose and the palate, followed up by bittersweet dark chocolate and just a tad of brown sugar sweetness to offset all that roast. Alcohol is fully hidden; it could certainly pass for a “non-imperial” stout if it wanted to. This is not the most explosive beer in the lineup, but it’s very well-balanced and a treat for the coffee beer fanatics. The verdict: This beer has been around forever, and it’s exactly the kind of thing that is perfect for hoarding in your cellar and setting up a 5 or even 10-year vertical, thanks to its general availability and aging potential. It’s a stout that feels big on the palate, enveloping it and earning adjectives like “burly” on tasting sheets. Heavy on the roast, and perhaps just a little bit “burnt,” it counters with a slight hop presence and balancing caramel/molasses sweetness, and dried fruit like raisin/prune. Wonderfully complex, it packs a mouthfeel that you would probably peg as even bigger/thicker than the 10.5% ABV. It’s a stout that you can set your watch by; dependable every single year. 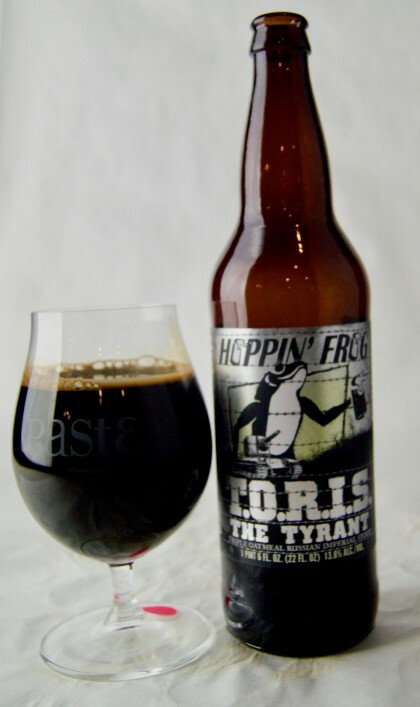 The verdict: Hoppin’ Frog celebrated the raising of Ohio’s beer ABV limit this year with the first ever brewing of T.O.R.I.S., the “triple” stout sequel to their classic B.O.R.I.S. and D.O.R.I.S. imperial stouts. And it’s big, big, big. From the first line of one score sheet: “Absolutely massive booze and roast, super viscous and pitch black.” This is one dense stout, a concrete wall of booze and flavor. Cocoa powder and French roast coffee make way for a tidal wave of alcohol, which brings dark fruity flavors of black cherry to the forefront. To quote another score sheet: “Perfect snow day beer,” presumably because if you drank a bottle of this stuff before going out in the cold, you’d be incapable of feeling much of anything. The only criticisms came from tasters who felt the booze threw the final beer too far out of balance, but that’s to be expected. This one is not for the faint of heart. 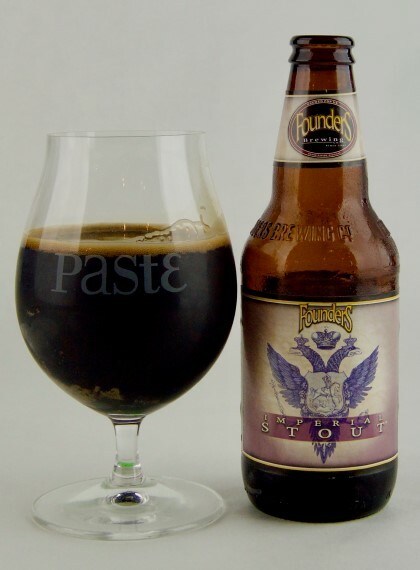 The verdict: Founders Imperial Stout is a bit oddly positioned, in the sense that it’s always sort of been in the shadows behind the more commonly sighted (and praised) Breakfast Stout, but it may actually be the superior example of “imperial stout” between the two. Capped with some brown foam that was a shade or two darker than most of the other big beers on the table, it seems to suggest decadence, which it does … in moderation. It has the body of a giant stout, but it tempers its size with balance: Fudgy, almost brownie-like chocolate is balanced out by firm, drying roast and lingering red fruitiness. The chocolate note in particular is the key flavor of this beer, and it works in a beautifully natural, organic way. One score sheet also notes another flavor of interest: “Toasty as chestnuts over an open fire.” We’d wager that it warmed that particular fellow’s heart. The verdict: There’s a couple of things that Clown Shoes does really well: Big IPAs and big stouts, and it shows whenever we do blind tastings. This one I’ve always liked in particular, a bit of a sleeper pick compared to several of the brewery’s many barrel aged monstrosities that are even bigger and more over the top. Made with a small amount of ash-smoked malt, it doesn’t lean hard on “smoke” as a flavor driver, relegating it to simply one note among many in the background. Coffee is pronounced, enough that you might mistake it for an actual coffee stout, along with dark chocolate and just enough residual sweetness to inject some levity into the proceedings. This is the type of imperial stout that likely appeals to just about everyone, and it also happens to be one that drinks frighteningly easily. It’s all too easy to handle a bomber of Undead Party Crasher on your own. The verdict: Odd name, but good beer. 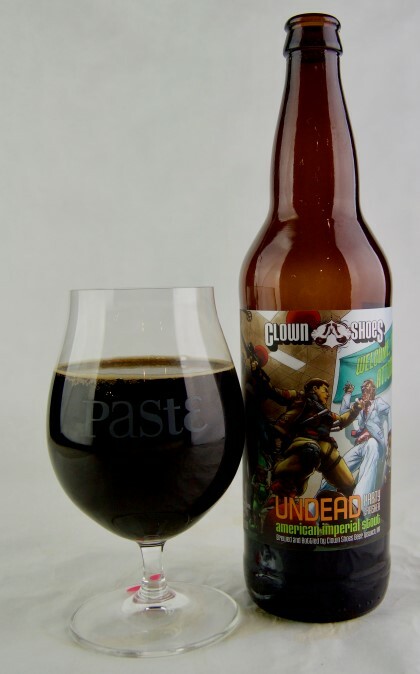 It’s probably vindicating to our taste buds on some level that this beer is again very similar to the one that precedes it, the Clown Shoes Undead Party Crasher. Both of them are unadulterated with adjuncts, but feature great roast character (particularly coffee). Both have a touch of smokiness, and more than a little dark cocoa, with a sophisticated hint of residual sweetness, and weigh in at 10% ABV. The one disparate flavor note here is hops, which are very mild but noticeable, contributing a mild earthiness and perhaps just the smallest bit of citrus. Like the Clown Shoes, it’s very, very drinkable for the ABV—an imperial stout for a weekend afternoon and a football game.